Princess Mononoke (“Mononoke-hime”) is a historical fantasy adventure film written and directed by anime legend Hayao Miyazaki of Studio Ghibli. The term “Mononoke” is actually a Japanese word for an angry spirit, and “Hime” is the Japanese honorific word for princess, so the name of the movie is really “The Spirit Princess.” For the English version, Mononoke was used as a name instead of being translated literally. Don’t let the word “princess” in the title throw you off. Though it’s distributed by Disney in the U.S., Princess Mononoke is nothing like the typical Disney love story; just as the fur-clad, blood-stained, knife-wielding girl is no Disney princess! And even though it’s an animated feature, Princess Mononoke is not intended for young children. It’s more for teens and adults because it deals with heavy issues and has some intense scenes, scary images, and graphic violence. When it was first released in Japan on July 12, 1997, Princess Mononoke became the island nation’s top-grossing domestic full-length feature. It replaced E.T. the Extra-Terrestrial (1982) as the highest grossing film of all time in Japan until Titanic was released there later that year. The English version of Princess Mononoke had a limited release in the United States on October 29, 1999 by Miramax/Disney. The main theme of Princess Mononoke focuses on man against nature. The forest spirits are not happy about the rampant destruction of their habitat by the miners. The Tatara scenes reminded me of The Lord of the Rings: The Two Towers, where the Orcs were clear-cutting the forest in order to stoke the “fires of industry.” The traditional Japanese Shinto religion is based on a harmonious relationship with the “infinite restless movement of Great Nature,” so the belief is that natural disasters are nature’s defenses to man’s disturbance. This idea is also mentioned in Episode 10 of the Ghost Hound anime, where it’s suggested that sometimes spirits will take revenge if abused by humanity. 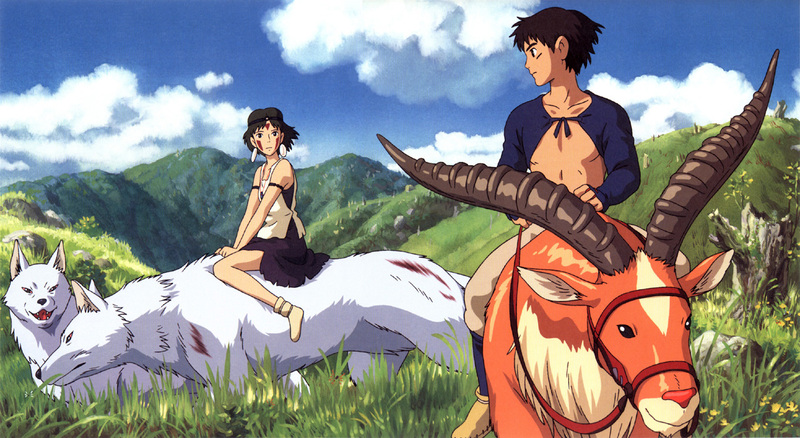 However, Princess Mononoke is more complex than the black-and-white good vs. evil theme common in American movies. Lady Eboshi herself isn’t totally bad because she’s a humanitarian who takes in social outcasts and gives them jobs. Ashitaka can see both sides of the issue so he tries to remain neutral, but going back and forth between the two just makes Ashitaka seem wishy-washy. Complicating matters is a mysterious human princess raised by wild wolves, who sides with the forest spirits. The battle between the natural and the industrial threatens to culminate in a widespread catastrophe with the potential to obliterate both sides. Princess Mononoke features spectacular artwork and cinematography supported by a rich orchestral soundtrack. The beautifully detailed forest is lush and alive with many different kinds of creatures and spirits, including the weird but cute little Kodama (my favorite things in the whole movie!). But among the humans, even though each of them is unique and could be interesting, their personalities lack dimension (some are just annoying), and there is very little character development, so the viewer doesn’t care enough about them to really root for anyone. The convoluted plot of Princess Mononoke is hard to follow at times, and the climax is a little too much like a contrived “deus ex machina.” After the epic build-up, the movie ended rather suddenly and anticlimactically. In the long run, the story itself is basically a political allegory about the impact of human advancement on the environment. And in spite of all the surrealistic elements, this anime does have a simple down-to-earth message – that we should respect the natural world by making use of its resources without destroying it. Princess Mononoke is available on DVD at Amazon.com .